Description: Pulse-pounding gaming and high-powered multimedia experiences require the ultimate in performance from your processor and motherboard. 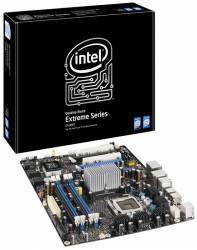 Intel® Desktop Board DX38BT is designed to unleash the power of Intel® Core™2 Extreme processors. With support for 1333 MHz front side bus, fast DDR3 memory and overclocking, Intel Desktop Board DX38BT delivers the gaming performance you deserve. Intel Desktop Board DX38BT supports Dolby Home Theater* and Microsoft Windows Vista* Premium WHQL certified.